Well, if anyone is interested, I think that Chang's Markef (in the original 1990 film) is an ideal starting point for such a terrain project. "Q. What are the dimensions of Chang's Market? A. You guys¸ you know how long ago this was? Well, okay, S.S. Wilson contacted Production Designer Ivo Cristante, who fortunately has an amazing memory for practically every set he's ever designed and built. Ivo is pretty sure Chang's store was 60 feet (along the front) by 30 feet deep. The ceiling was 12 feet (because it had to be high enough to do the action where Rhonda climbs on the shelves). There was a two foot tall parapet ("railing") around the roof (so the top of the parapet is at 14 feet). On the front, the parapet is taller. It goes up in two steps to about 4½ feet (16½ total). You can get a sense of how tall the front parapet is when Val puts the radio on it to talk to Burt." Hope this helps whoever is attempting such a task. You guys are gonna love this!!! The population of Perfection was just 14 (according to the sign on the road). Aside from Walter Chang's Market, and the house where Nancy lived with her little daughter Mindy, it seems like everyone else lived in travel trailers or larger mobile homes. The large rusty Quonset and the dilapidated home behind Nancy and Mindy's house both seem uninhabited. Melvin (the annoying teen) – lived across the street from Chang's Market, in a mobile home with an astroturf porch, right next to a rusted up Quonset. No idea where his parents were. Melvin had his own play shack across the street, between Chang's Market and Nester's trailer. Val and Earl – each lived in a separate travel trailer, located across the street from Chang's Market, between the rusted Quonset and the junkyard. Melvin was on the other side of the Quonset. Nestor – lived on same side of the street as Chang's Market, in a travel trailer, surrounded by a corrugated metal fence. There seems to be a gas pump and/or mailbox up front(?). Walter Chang – no telling where he lived, though I suspect the most logical place would be the mobile home past the water tower. The mobile home had an awning. The trailer wasn't too large but, then again, there's no mention of him having a wife with him. It doesn't look like he lived at the store. If we include Melvin's parents (not even mentioned in the film), that only accounts for 9 of the presumed 14 residents of the town. I believe that Burt and Heather lived too far to be within the town limits. But, if they are considered to have been within town limits, then the number is 11, with just 3 unaccounted for. Also staying out of town limits were the doctor and his wife, the sheep rancher and the fella who got hypothermia while hanging up on a tower. Not sure where Rhonda (the seismologist girl) was staying. I watched the movie again this morning (can you believe that!) and there's no way that Val and Earl live across from the market. The only trailer close to the Quonset is the one Malvin's family lives in. There's no other place for their two trailers except past the water tower and the trailer I call Chang's. There are two smaller trailers in the distance, right next to a large red one (abandoned-looking). What do you think of this initial basic layout? Those building cutouts are resting on a 2' x 4' MDF gaming board, with 6" grids. "Q. 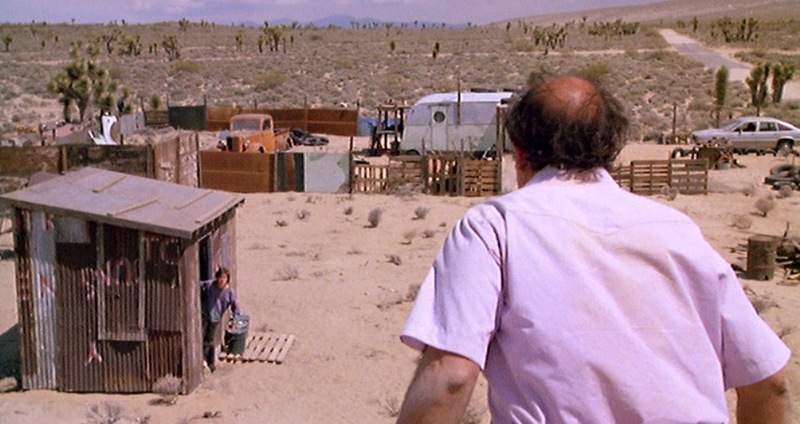 Who was the adult guardian of Melvin in Tremors? A. This is actually a question to which we gave considerable thought: "Why is there a lone teenage kid in Perfection?" Here's Melvin's Tremors 1 back story: he's the son of rather irresponsible parents who regularly leave him home alone to go gambling in Vegas. The townsfolk long ago got used to the situation, as people in small towns do. 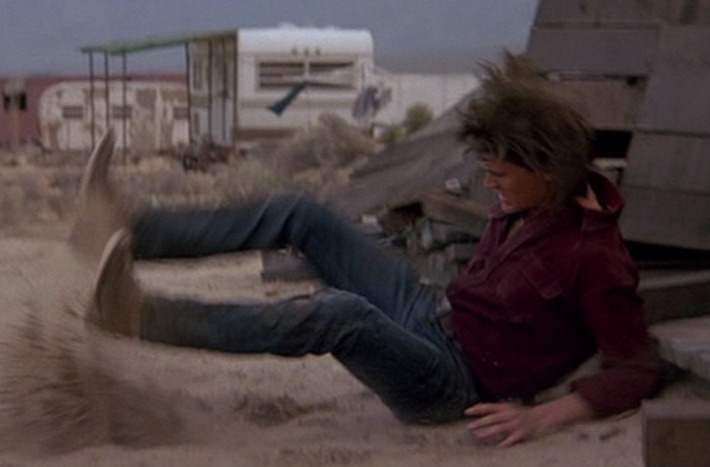 There was a line explaining this in the original Tremors 1 script. It was said by Val or Earl and was something like, "I wish his parents would just take him with them to Vegas." As a result, Melvin turned out sort of selfish and money-hungry in Tremors 3, but we understand him since he had to fend for himself from a young age." "Q. Which way does Perfection Valley run? A. Okay, some of you say it's north-south, and some of you say it's east-west. We think it's north-south. Here's why. First of all, that's the way the original town was built in the Lone Pine area. Chang's Market was on the west side of the street. North was toward Nestor's trailer (Nestor was the guy pulled through the spare tire.)" Wow. This research just keeps getting better and better! BTW, in that Flickr set there are now 128 different maps and angles for you guys to look at and use in making your own Perfection gaming board! Looks like I'll have plenty of time to sit and think about more details for this giant worm project (and many, many others too). In about 6 hours I'll be having that exact same thing done to my left heel. The actual surgery time should be about 30-45 minutes. And then I'll be sent home after anesthesia wears off. I think the hardest part will be having to walk on crutches for 4-6 weeks. Now that I'm done with that surgery and have had 3 weeks to recuperate a bit, I think I can walk (slowly) over to the garage and start pulling some of the materials I'll be needing for this project. I just wish I was a little better at determining distances and relative positions on pics like that. It looks like I may have to scratch-build most of the structures myself. I like the fact that the gentleman is very specific as to what size materials he used for each bit. It may not be Perfection (Nevada), but I like his overall style. I've always loved that movie. If you build it, I may have to drive over to Katy and make you play the game with me. How's the leg, by the way? Believe me, you'll be one of the first people I invite over, if I ever finally get this project off the ground!!! I had been making great strides (pardon the pun) with my left Achilles right up until this week. Now the back half of my left foot is about 50% bigger than it should be, it's hot to the touch, and I feel like there's something really wrong with circulation (below the inside facing ankle it's a bit purple, like when I first had the surgery 6 weeks ago). Maybe I've been overdoing it with the tendon exercises. Either way, I'm going to be at the doctor's office first thing in the morning, unless I'm forced to head to the hospital before morning. The pain, swelling and discoloration really had us worried last night. But it turns out it is part of the healing process, despite it being over six weeks since the surgery. 1 Catepillar tractor, in the trash field, close to an open trailer without tires – bought matchbox tractors (one may be the right type). Still looking for the right trailer portion for it. Looks like, little by little, this project is making some progress. I prefer plastic buildings (already built or kits), but some of those aren't available or affordable right now. So, for the first time ever, I'm looking at printed cardstock as my only remaining solution for those. With that clapboard siding, I should be able to start on Chang's General Store AND Nancy's house. I am a few months out from doing any large stuff, but I have designed and cut out about 15 outhouses on Sat. New laser cutter, still learning and taking notes. But if you need a few custom etched sheets let me know. I will try and get them too you. Your modeling has always been inspiring. 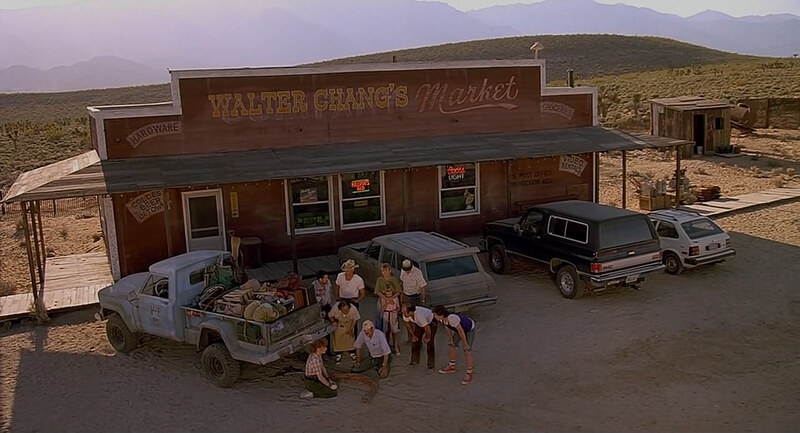 Also, what used to be on Walter's store? I think it says Corn and the second word is harder to see. Thinking this may be an often used set. Are you sure it doesn't say "Company"? PS. 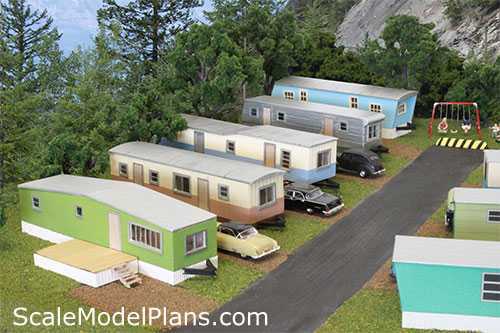 By the way, when you are ready to work with the equipment, will you be able to make things like sides, floors and roofs of 2 mobile homes (Melvin & parents, and one for Walter Chang) and 3 travel trailers (Nestor, Val and Earl's)? I'm glad you like it, and that that big worm of mine was finally produced. All good now, for the most part. 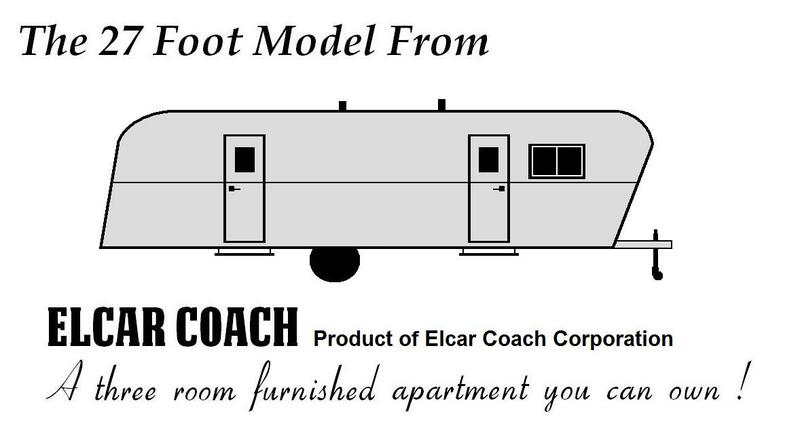 I wish I could find something like that for the trailers and campers. I have to go get this movie out now. I don't know id I've seen it. I got out the first three. I watched number one straight away and realy enjoyed it thanks Dan! The original is the best, in my opinion. All the main characters were well developed and the dynamics between all of them was fun to watch. The first time I watched it I thought it would make a fantastic gaming set up. I still feel it could. And I just love them graboids! 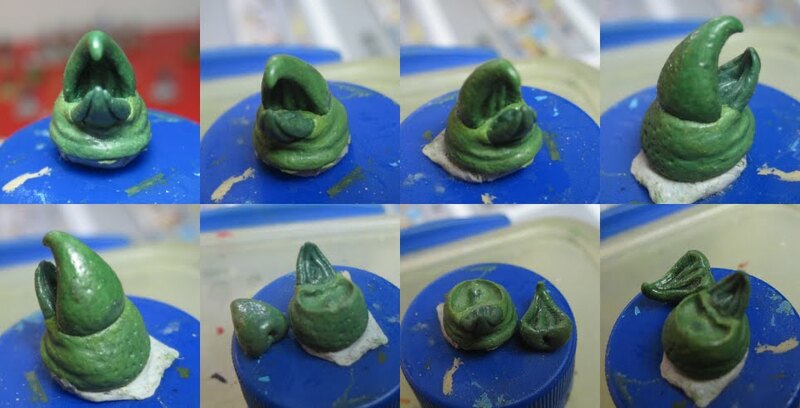 I was thinking these little fellas, with a good paint job, could pass for the smaller ones from the second movie. These a suposed to be 6mm bugs but I was using them with 15mm figures. I got them from GZG earlier this year but can't find them anywhere on their web site now. I'll round it up to a 30-footer. At 3mm per foot, that means a unit 90mm long. 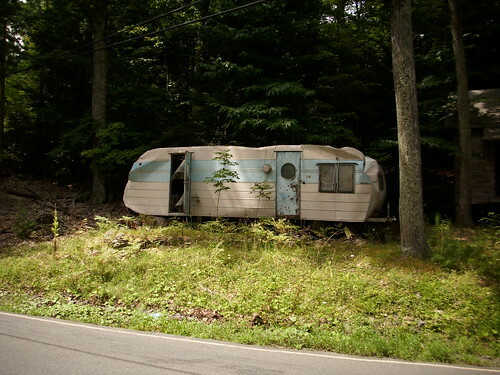 Ha ha that caravan has had a hard life! 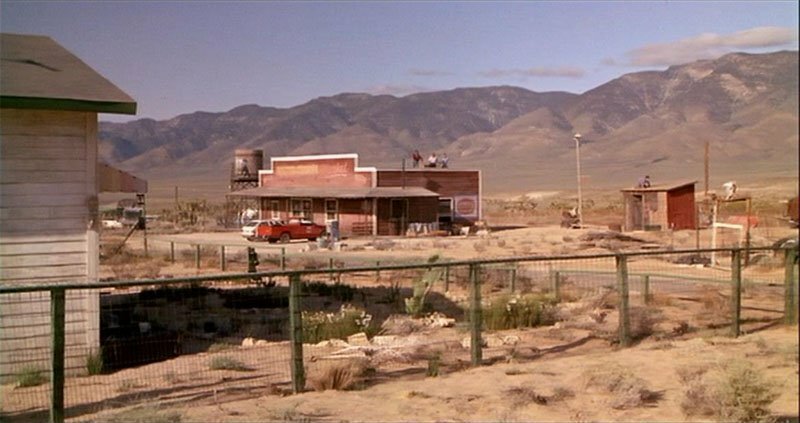 The original Tremors (1990) is now on Netflix!!! Hows your progress with this Dan? Have you got any further along? I did find some links for free paper model static/trailers somewhere that look suspiciously like the ones your after, not sure of the scale (but think it was HO)I'll have a look later for them, failing that I might even have the files downloaded so I'll check them too if your still in need of them!